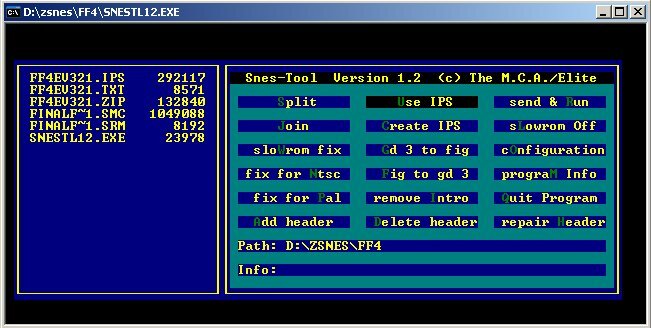 Before starting, you should note that hard patching your rom will permanently change your rom, so if you wish to have a copy of the original rom, make the copy before you apply the patch! Select your patch and press enter. 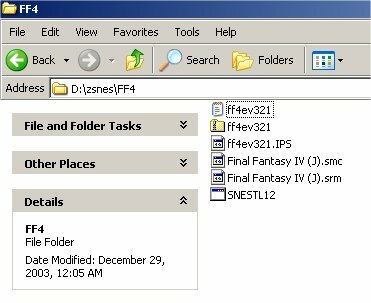 You now have to select your rom file. You have to be careful if you have more than one rom in your folder as the program uses DOS 8 character names. I always recommend keeping only one rom in your directory as having similarily named files can lead to confusion. Press enter, and voila, the rom is patched! Also note that some patches require you to add or delete the header in the rom (always read the faq that comes with the patch to make sure). Using Snestool, you can do this using similar steps as above.